After a whole lot of side plotting last week, we return to the sisters, Vanessa the Honey Badger (who is surprisingly non-badgery this week) and Scarlett. A random vampire attack spatters blood on the book and it reveals a map! Sister road trip! They steal a boat which gets Vanessa shot with a shotgun which is briefly inconvenient but yeah they’re this immortal. They arrive on an island, abandoned now the last survivor on the island has committed suicide, and find it eerily well preserved, untouched since the rising. They find a projector and do some random puzzle-game steps to change the map enough for them to find their X - a cross that needs opening with magical Van Helsing hands just like the first elder’s home. And inside they find another elder. Also this actor plays Bobo Del Ray on Wynonna Earp, who knew you could be typecast as an insane rambling vampire? How is there even this many roles for this to become a thing for an actor? His babbling is frustrating to parse, he explains he was turned chasing an elder with his brother Abraham (and he and that elder fell through a portal into a labyrinth which could be just about… ANYTHING?!). And he became an elder because he was chosen to be one. So elders can pass on their rank? Or they can lose it? Do they just pass on the totem? SO MANY QUESTIONS HERE!? How come no-one asked about the whole elder transfer process?! Yes we have a huge revelation here - because previously it had been implied that Vanessa and Scarlett had their super powers because they were experimented on as children. 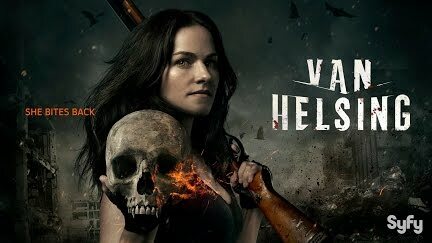 But apparently it’s a Van Helsing thing, at least a little. Oh and Scarlett has his totem already - it’s the necklace of elder blood. Vanessa is surprisingly patient with him and even lets him out so he can help them and being shockingly calm about his crypticness. Who knew the Honey badger could be this calm? Of course she does say they’re going to kill him and they’ll just kindly make it quick. He does beg for them to change him back to human - but Vanessa refuses because every time they do that they change a bit more - presumably this is why Vanessa is becoming more and more badgerlike. And despite Scarlett having done it so much less, she refuses to let Scarlett try… which seems… bizarre? Why? One more bite for a relative? Who wants it? Scarlett is really not happy and I can’t help but agree with her. Scarlett remembers all the times Vanessa talked about her growing monstrousness and she begged Scarlett to stop her before she turns into a vampire or something worse. And Vanessa finds the man who shot her and kills him. Yes she’s definitely gone over the edge. We’re way beyond honey badger now.